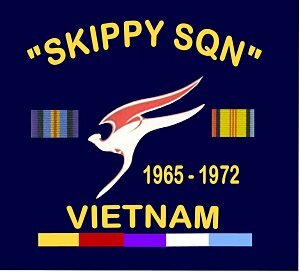 Skippy Squadron was formed in 2002 by the volunteer Qantas aircrew and ground staff who operated and supported military charter flights in the prescribed area of operations during the Vietnam war, maintaining the commitment established by their predecessors during the Second World War. Members are eligible for the award of the Australian Active Service Medal 1945-1975 with Clasp Vietnam, and the Vietnam Logistics & Support Medal. Eligibility was confirmed by Government Gazette on 23 April 2001. Skippy Squadron organiser, Alan Kitchen, has made an extensive study of Qantas charter flights to Vietnam from June 1965 to February 1972 and has established that at least 300 flights in/out of Saigon were chartered to the RAAF to carry troops to Vietnam. According to National Australian Archives Inward Customs Register in June 1965, B707-138B VH-EBI operated four flights from Saigon as shown in the following table. Source NAA SP9341/1 & 2 Inward Customs Register. K.S.A. The captains shown in the table operated MNL/SGN/SYD. There is no record of captains who operated the Richmond/MNL and TSV/MNL sectors. VH-EBI was the first of the 707s to operate into Tan Son Nhut Airport, Saigon with Australian troops on board on 31 May 1965 arriving back in Sydney the next day as QF120. In mid 1966, the flight numbers for Vietnam charters changed to QF 177/QF178. The Saigon flights were routed via Manila as the Indonesian Government would not permit them to overfly Indonesia with troops on board, especially as they had their rifles stowed in a netted bin at the rear of the cabin. Alan Kitchen has been unable to locate any records of Saigon flights after 1966 although he estimates that access to tech crew log books has provided approximately 20% of the missing data. Accordingly, Alan will be very pleased to hear from any Qantas tech crew who operated flights to/from Saigon. A model of VH-EBI was presented to the Australian War Memorial in Canberra on 30 January 2007. The model is to be displayed in a proposed post WWII Gallery some time later in 2007.